I understand that First Eastern Counties' last step Dart was withdrawn on Saturday. Number 46379 (M379YEX) spent its last months operating from Caister Road depot and is pictured here in Regent Road on the 4th January this year on one of its usual workings. Presumably it will now be keeping the triaxles company at the rear of the depot before being towed away for scrap. First Eastern Counties was using a Great Yarmouth-based Premiere on the 14.55 Lowestoft to Kings Lynn this afternoon. The vehicle, 20126 (P776XHS), is pictured at Market Gates. Ipswich based Dart 46440 (N810VOD) was unusually noted in the town's Market Gates on service 8. Presumably this is a recent transfer? 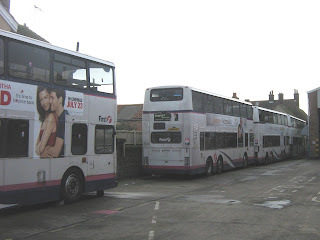 Since my last opportunity to view the rear yard of Caister Road bus depot, all three Darts have now been removed leaving just the six withdrawn triaxles. 30097 and 30098 (K481/2 EUX) are still alongside the Harley Road fence as shown in my blog of 13th January 2011. The remaining four are parked against the southern boundary with 30101 (K485EUX) nearest the camera and 30105 (K489EUX) to the right of that. The two others are 30100/4 (K484/8EUX) but I could not identify which was which. 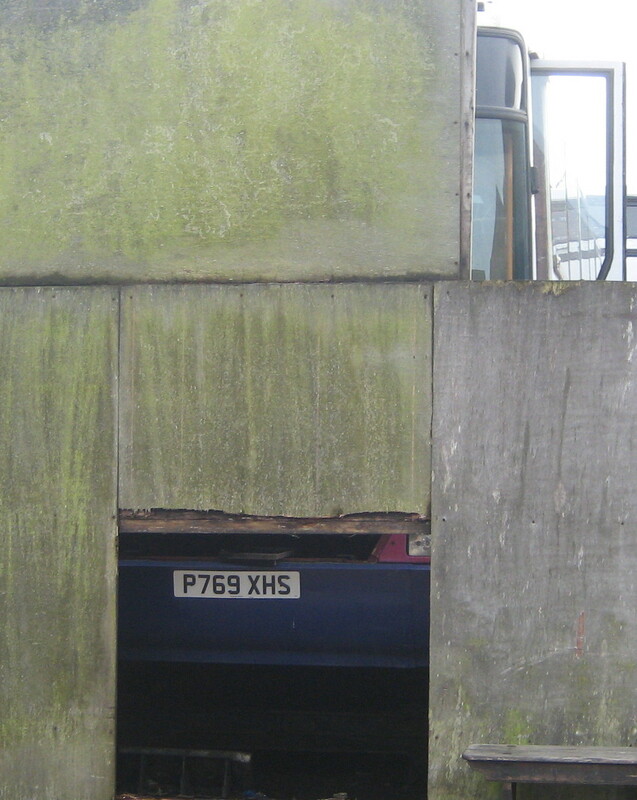 Hidden behind the fencing, but on the ramp, was withdrawn Volvo B10M/Plaxton Premiere 20129 (P769XHS) with only its numberplate showing through the gap in the fence! Compared to last week's sunshine, today's Shearings vehicle is pictured in the continuous rain at Great Yarmouth's Beach Coach Station late this afternoon. 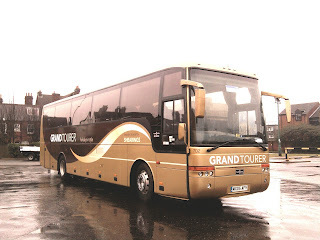 The visitor was Grand Tourer 602 (MX04AEB) a Volvo B12M/Van Hool 42 seater. The latest edition of Buses dropped on my doormat earlier this week and its only now that I have been able to digest much of its contents! Page 7 contains a report of £4 million worth of orders placed with bus manufacturer Optare. 'These include three more Versas for Anglian Bus to add to five others, 24 Solos and two Tempos in the 60 strong fleet' the article adds. Under Fleet News, City Sightseeing Leyland Olympian/ Northern Counties open-top E767LBT has been sold to City Sightseeing of Cyprus. The vehicle operated in Great Yarmouth towards the end of last year's summer season. Unusually spent some of Sunday morning shopping in Norwich. I spent around an hour at lunchtime observing workings in a cold and overcast city. As expected on a Sunday in February, there was not a lot to see. However, I did note Sanders Omnicity 309 YN53GFE (top) waiting at its stop in St Stephen's Street for its next run to the North Norfolk Coast. Needless to say it wasn't too long before I returned to the warmth of the shopping centre!! 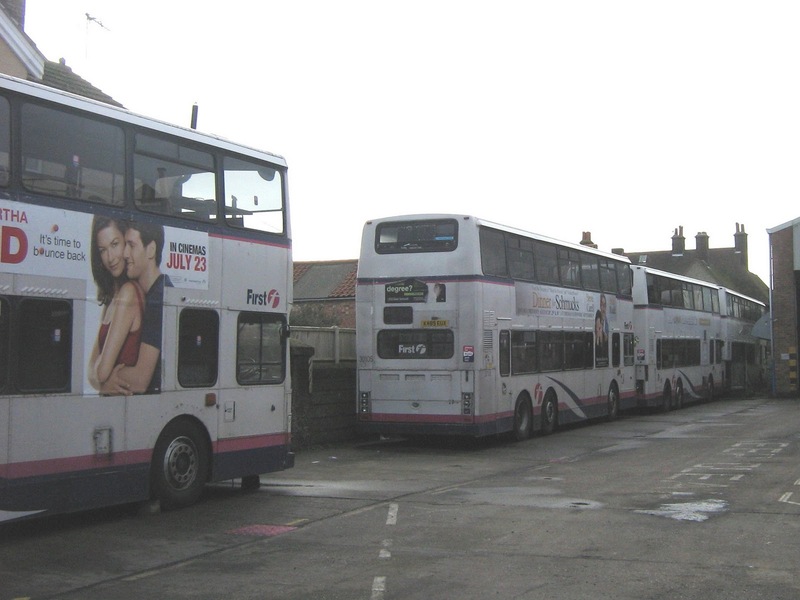 First Eastern Counties has confirmed that no significant changes will be made to its X1 service which connects Great Yarmouth with Norwich, Dereham, Kings Lynn and Peterborough. The new timetable for the service is due to be published at the end of March. In the meantime, a Punctuallity Improvement Plan is to be prepared by the company to identify possible ways of dealing with delays being experienced on the route. 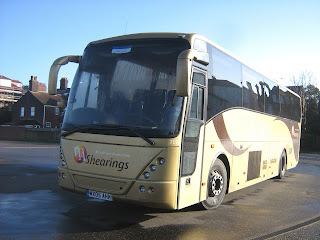 An early morning journey passing the town's Beach Coach Station revealed another Shearings vehicle basking in the sun! This time it was Volvo B12M 717 (MX05AHK) in Euro Tourer colours complete with WA logo. She was also noted passing through Market Gates Bus Station yesterday afternoon, but I was unable to get a reasonable photo. Some 90 minutes of observation in Market Gates Bus Station didn't reveal too much out of the ordinary! First Eastern Counties Gemini 37156 (AU07DXS) was noted (top) working the X1 through to Lowestoft at 15.00. Around 30 minutes later another Lowestoft vehicle worked through on the 1A to Martham - this time it was President 32212 (LT52WTV) which is seen (bottom) in the gloom of Market Gates Bus Station. Veteran Dart 46379 (M379YEX) was still in gainful employment as it was seen later in the afternoon working southbound on an unidentified Gorleston area service along Southtown Road. Variation Accepted: Operating between Caister and JPH given service number 8/8A/8B effective from 27-Mar-2011. To amend Route and Timetable. Variation Accepted: Operating between LOWESTOFT and MARTHAM given service number 1/1A/1B effective from 27-Mar-2011. To amend Route and Timetable. Variation Accepted: Operating between GREAT YARMOUTH (BARRACK ESTATE) and CAISTER (CIRCULAR) given service number 4 effective from 27-Mar-2011. To amend Route and Timetable. Variation Accepted: Operating between Great Yarmouth, Market Gates and Bradwell/Belton given service number 6/6B/7 effective from 27-Mar-2011. To amend Timetable. Variation Accepted: Operating between Great Yarmouth, Market Gates and Burgh Castle given service number 5 effective from 27-Mar-2011. To amend Timetable. Variation Accepted: Operating between Reedham and Great Yarmouth given service number 730 effective from 01-Apr-2011. To amend Timetable. Variation Accepted: Operating between New Rackheath and Gorleston given service number 731 effective from 01-Apr-2011. To amend Timetable. Variation Accepted: Operating between Gorleston and Lowestoft given service number 606/607/608/609 effective from 04-Apr-2011. To amend Timetable. Dart/Alexander 47250 (M250VWW) has been withdrawn at Caister Road depot. Sister 47251 (M251VWW) went to Erith Commercials yesterday for scrap. She is seen here in better times in Gorleston High Street working the service 7 to Belton on 23rd April last year. 47250's demise leaves only one step entrance Dart in service. I wondered down to Great Yarmouth's Beach Coach Station in the rain this afternoon and found another Shearings vehicle present. This time it was their 702 (MX05AFV) in Grand Tourer livery and I didn't have my camera with me. However, the mobile phone was handy and I managed to get a reasonable picture with it considering the rain! A further Shearings vehicle was noted sunning itself in the February sun at Great Yarmouth's Beach Coach Station this afternoon. Setra 218 (BF10VCL) looked as though it had recently been washed too! Moments later First Eastern Counties 37160 (AU07DXX) appeared on the X1 for Lowestoft. Also of interest was a National Express vehicle working on the 727 service. CO82 (LK53KVZ) arrived in the Bus Station a little behind schedule at 12.20. Norse's Mercedes Vario 7137 (YN53VBZ) was also parked up awaiting its next run to County Hall. The vehicle seems to have recently been painted in mainly white livery with NORFOLK COUNTY SERVICES TRANSPORT emblazoned on the sides. 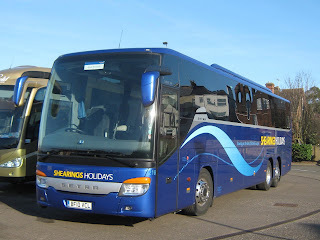 Another Shearings vehicle was sighted along the town's seafront this afternoon. This time it was Volvo B12 fleet number 626 (MX04AFU). She is pictured on Marine Parade, close to the Hollywood Cinema, in the wintry sun. Grahame informs me that withdrawn Darts 47207 (M207VWW) and 46375 (M375YEX) have been collected from Caister Road by Erith Commercials for scrap. Meanwhile, Flying Banana liveried RML39623(NML623E) has moved to Norwich for storage. She is seen here operating the Service 3 to Seashore Camp through Market Gates on 20th June 2007. Grahame also reports a couple of odd Great Yarmouth area workings from the weekend; 20115 (N615APU) on the 1/1A Martham - Lowestoft service on Saturday (29th January) when another Olympian was out on the 5's to Burgh Castle - this time it was 34109 (W436CWX). 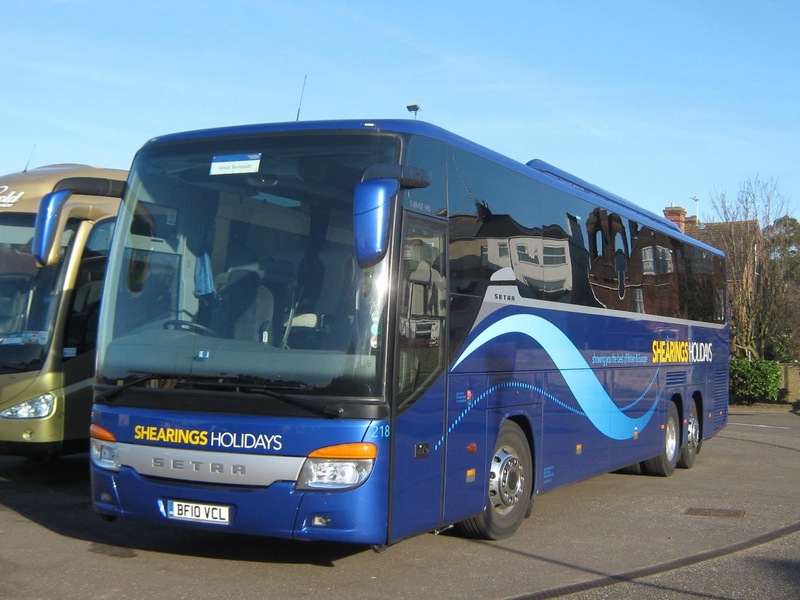 The Shearings Group restarted their regular tours of the Great Yarmouth and Norfolk Broads area at the end of January. 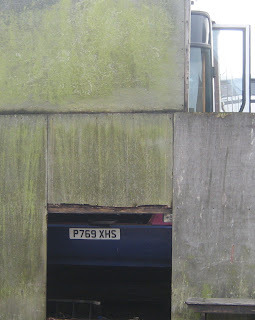 Although two of their vehicles were recently seen in the town, I was unable to photograph either of them! However, I was more fortunate with the latest visitor; Setra 106 (BK09RMY) is seen in the early morning sunshine at Beach Coach Station. From Sunday 6th February 2011, First Eastern Counties is making changes to its commercial bus fares. Day, Week, Month, 3-Month and Annual tickets will generally increase in price. For the Great Yarmouth Town zone, two trip tickets for adults will cost £3.70 and for children £2.50. Corresponding ten trip tickets for the zone will be priced at £20 for adults and £13.50 for children. A number of single and return fares will increase, although many remain unchanged.